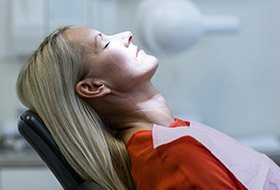 Do you avoid going to the dentist because of fear or anxiety? Did a bad experience in the past turn you off to dental care entirely? At Corbin Family Dental Care, we’re able to calm and successfully treat nervous patients every day, largely thanks to sedation dentistry. Dr. Whitaker has dedicated herself to becoming an expert in these techniques so that more people can enjoy stress-free trips to the dentist and take care of their teeth with peace of mind. If you’re ready to experience the most relaxing dental appointment of your life, give us a call today to discuss your sedation options. Why Choose Corbin Family Dental Care for Sedation Dentistry? “I am so happy that I chose to be sedated for my procedure. The entire process was so simple and Dr. Whitaker and her team ensured that I knew what was going on and what to expect. They treated me like family. Dr. Whitaker even phoned later that same evening to ensure I was doing ok after the procedure. So very thankful that I found Dr. Whitaker and her team! They are amazing!” – D.C.
“I was very apprehensive due to past medical history but this experience was wonderful. No problem with IV. Staff was great. I left feeling fine and would highly recommend. I am very pleased.” – V. H.
“I loved it all. I liked the calming meds before my sedation appointment. I don’t remember a lot and I’m thankful. I had a very good experience and all the ladies were very nice. 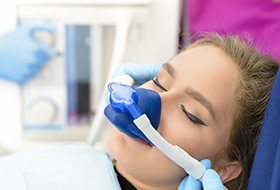 I would do sedation again if I needed treatment on my teeth in the future.” – C. S.
Nitrous oxide is a sedative you simply inhale, and it has been used in dental offices for nearly 100 years. It is a relatively mild pain reliever, but it’s particularly good at relieving anxiety. It is administered through a small nasal mask which resembles a cup that is placed over the nose. A patient breathes in oxygen mixed with nitrous oxide, which quickly creates a light-headed or even euphoric feeling. Fortunately, this is quick to wear off, so there is no “hangover” effect. With this method, a sedative is administered directly into the bloodstream intravenously (into the vein), enabling it to act much more quickly than our other sedation options. The patient will remain conscious for their entire appointment, but time will seem to fly by very quickly and they will likely have little to no memory of their visit afterwards. Because of its potency, there is a higher level of training required for those who administer it. Right now, Dr. Whitaker is the only dentist in a 40-mile radius who is qualified to use IV sedation, helping her serve a wider variety of patients. Patient wants multiple procedures completed in a single appointment to save time. Because patient safety is always our top priority, we will ask a patient for a medical history as well as a list of all the medications they are currently taking before using IV sedation. At a brief consultation with Dr. Whitaker, she can help you decide which sedation method might be best for your particular situation. It should be noted that Dr. Whitaker only sedates adults and will not sedate a child . To help nervous children, she and our team will implement more traditional behavioral modification techniques.